The orbital and rotational dynamics of Saturn's moons have unusual and puzzling characteristics, some of which are related to their interactions with the rings. For example, the three small moons Janus, Epimetheus, and Pandora orbit near the outer edge of the main ring system and are thought to have been receiving angular momentum, amounting to a minuscule but steady outward push, from ring particles through collective gravitational interactions. The effects of this process would be to reduce the spreading of the rings caused by collisions between ring particles and to drive these moons to ever larger orbits. Because of the small size of the moons, scientists have found it difficult to find a mechanism by which this process could have endured over the age of the solar system without driving the moons far beyond their current positions. The sharpness of the outer edge of the main ring system and the present orbits of such inner moons as Atlas are puzzling, and they appear to support the idea that the current ring system is much younger than Saturn itself. Janus and Epimetheus are co-orbital moons—they share the same average orbit. Every few years they make a close approach, interacting gravitationally in such a way that one transmits angular momentum to the other, which forces the latter into a slightly higher orbit and the former into a slightly lower orbit. At the next close approach, the process repeats in the opposite direction. Tethys and Dione also have their own co-orbital satellites, but, because Tethys and Dione are much more massive than their co-orbit-ers, there is no significant exchange of angular momentum. Instead, Tethys's two co-orbiters, Telesto and Calypso, are located at the stable Lagrangian points along Tethys's orbit, leading and following Tethys by 60°, respectively, analogous to the Trojan asteroids in Jupiter's orbit. Dione's Trojan-like companions, Helene and Polydeuces, lead and follow it by 60°, respectively, on average. Several pairs of moons are in stable dynamic resonances—i.e., the members of each pair pass one another in their orbits in a periodic fashion, interacting gravitationally in a way that preserves the regularity of these encounters. In such a resonance the orbital periods of a pair of moons are related to each other approximately in the ratio of small whole numbers. For example, the orbital periods of Hyperion and the nearer Titan, at 21.28 at 15.94 days, respectively, are in the ratio 4:3, which means that Titan completes four orbits around Saturn in the time that it takes Hyperion to complete three. Titan and Hyperion always pass most closely at Hyperion's apoapse, the farthest point of its elliptical orbit. Because Titan has more than 50 times the mass of Hyperion and always transmits the most momentum to the smaller moon at the same points along its orbit, Hyperion is forced by these periodic "shoves" into a relatively elongated (eccentric) orbit. Analogously, the moon pairs Dione and Enceladus and Tethys and Mimas have orbital periods in the ratio 2:1. Because resonances between pairs of moons can force orbital eccentricities to relatively large values, they are potentially important in the geologic evolution of the bodies concerned. Ordinarily, tidal interactions between Saturn and its nearer moons—the cyclic deformations in each body caused by the gravitational attraction of the other—tend to reduce the eccentricity of the moons' orbits as well as to brake their spins in such a way that they rotate at the same rate as they revolve around Saturn. This state, called synchronous rotation, is common in the solar system, being the case, for example, for Earth's Moon and several of Jupiter's nearer moons. For a moon that rotates with respect to its planet, the internal deformation is dynamic; it travels cyclically around the moon and generates heat by internal friction. Once a moon is in synchronous rotation, it always keeps the same hemisphere facing the planet and the same hemispheres forward and rearward in its orbit; the deformation no longer travels but remains stationary in the moon's reference frame, and fric-tional heating does not occur. However, even a moon in synchronous rotation experiences tidal interaction if it is forced into an eccentric orbit by resonance; as it travels alternately farther from and closer to its planet, the ensuing dynamic deformation heats its interior. The most dramatic example of such a moon is Jupiter's Io. Although calculations indicate that the present tides on Saturn's moons are not particularly significant as a heating mechanism, this may not have been true in the past. Furthermore, the hot "tiger-stripe" region of Enceladus is the present-day source of the icy material for the diffuse E ring in which it orbits. The cause of the region's thermal activity remains to be deduced, but it is likely to be related to some form of tidal deformation. 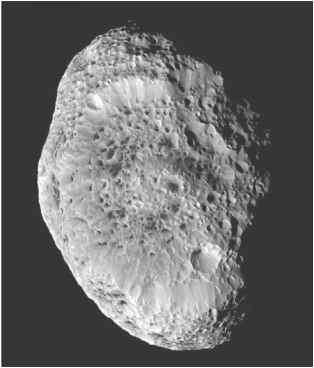 Saturn's impact-scarred moon Hyperion, in a photograph taken by the Cassini spacecraft during a close approach on September 26, 2005. Hyperion's interior may be a loose agglomeration of ice blocks interspersed with voids, which would account for its low mean density (half that of water ice) and would explain its unusual "spongy" appearance in Cassini images. NASA/JPL/Space Science Institute object known in the solar system to be in chaotic rotation. Titan is the largest moon of Saturn and the only moon in the solar system known to have clouds and a dense atmosphere. It was discovered telescopically in 1655 by the Dutch scientist Christiaan Huygens—the first planetary satellite to be discovered after the four Galilean moons of Jupiter. The moon is named for the Titans of Greek mythology, which include Cronus (equated with the Roman god Saturn) and his 11 siblings. In an Earth-based telescope, Titan appears as a nearly featureless brownish red globe, its surface permanently veiled by a thick haze. It is larger than the planet Mercury and more massive than Pluto, and, in significant ways, it resembles a planet more than it does a typical moon. Titan orbits Saturn at a mean distance of 1,221,850 km (759,220 miles), taking 15.94 Earth days for one revolution. It rotates once on its axis for each revolution—i.e., its rotation is synchronous—so that it always keeps the same face toward Saturn and always leads with the same face in its orbit. The diameter —» of the solid body of Titan is 5,150 km (3,200 miles), only about 120 km (75 miles) less than that of Jupiter's moon Ganymede, the largest moon in the solar system. If its hundreds of kilometres of atmosphere are included, however, Titan far exceeds Ganymede in size. Titan's relatively low mean density of 1.88 g/cm3 (1.1 oz/in3) implies that its interior is a mixture of rocky and icy materials, the latter probably including ammonia mixed with water and methane and possibly including liquid layers, covered by a solid, mostly water-ice crust. A rocky core may lie at the centre and extend to perhaps 80 percent of the total radius. In its bulk properties, Titan resembles other large icy moons of the outer solar system, such as Jupiter's Ganymede and Callisto and Neptune's largest moon, Triton. Titan's atmosphere was first detected spectroscopically in 1944 by the Dutch American astronomer Gerard P. Kuiper, who found evidence of the absorption of sunlight by methane. However, studies of the refraction (bending) of radio waves in the atmosphere carried out during Voyager 1's flyby in 1980 showed that methane molecules must make up only a few percent of the total number of molecules in the atmosphere and that the predominant molecules are not detectable in visible-light spectra. Comparison of infrared and radio data from Voyager revealed that the atoms and molecules making up the atmosphere have a mean molecular weight of 28.6 atomic mass units. Thus, Voyager correctly identified the most plausible major constituent to be molecular nitrogen (mean molecular weight 28), although some atomic argon (mean molecular weight 36) could also be present. Other constituents detected by Voyager in Titan's atmosphere via their absorption of ultraviolet light from the Sun were molecular hydrogen and many carbon-bearing molecules, believed to be produced by solar ultraviolet light acting on methane and nitrogen at high altitudes. These include carbon monoxide, carbon dioxide, and the organic gases ethane, propane, acetylene, ethylene, hydrogen cyanide, diacetylene, methyl acetylene, cyanoacetylene, and cyanogen, all observed in trace amounts. Titan's atmosphere is similar to Earth's both in the predominance of nitrogen gas and in surface pressure, which is about 1.5 bars, or 50 percent higher than sea-level pressure on Earth. The moon's atmosphere is much colder, however, having a temperature at the surface of 94 K (-290 °F, -179 °C), and it contains no free oxygen. A troposphere analogous to Earth's extends from Titan's surface to an altitude of 42 km (26 miles), where a minimum temperature of 71 K (-332 °F, -202 °C) is reached. Clouds of nitrogen are not present, apparently because temperatures are always above the condensation point of nitrogen. Initial data from the Cassini-Huygens spacecraft, which began exploring the Saturnian system in 2004, show that methane is indeed a minor, but very important, atmospheric constituent, possibly playing a role analogous to that of water vapour in Earth's troposphere. Near Titan's surface, about 5 percent of the atmospheric molecules are methane, the fraction decreasing with altitude. (For comparison, Earth's lower atmosphere contains about 1 percent water vapour on average.) When Cassini first encountered Titan, it observed a large outburst of methane cumulus clouds over Titan's south polar region. 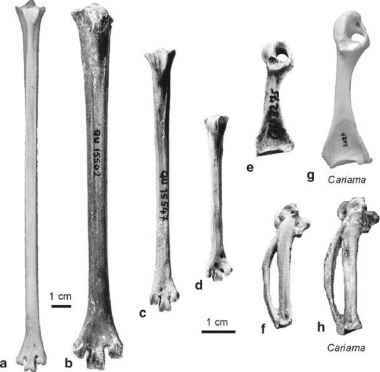 There also is indirect evidence that methane "rain" occasionally precipitates near the surface. In contrast to water on Earth, however, a liquid methane ocean does not exist on Titan, because it would require an atmospheric mixing ratio of 12 percent, contrary to observation. Titan has a thin atmospheric layer of roughly constant temperature above the troposphere, followed by an extensive stratosphere ranging from 50 to 200 km (30 to 120 miles) in altitude, where temperatures steadily increase with altitude to a maximum of 160 to 180 K (-172 to -136 °F, -113 to -93 °C). Studies of the refraction of starlight in Titan's upper atmosphere show that temperatures remain in this range up to an altitude of 450 km (280 miles), and spacecraft observations of the transmission of solar ultraviolet light give similar values at even higher altitudes. Saturn's moon Titan, in a mosaic of nine images taken by the Cassini spacecraft on Oct. 26, 2004, and processed to reduce the veiling effects of the moon's atmosphere. The view is centered slightly south of the equator, with north toward the top. The continent-sized region Xanadu Regio shows as the large bright patch on the right, while bright methane clouds appear near Titan's south pole. NASA/JPL/Space Science Institute tint. Extraordinarily pervasive throughout Titan's atmosphere, they are substantially dense even at altitudes as high as 300 km (200 miles) and pressures below one millibar. The Huygens entry probe observed haze particles as it descended through the troposphere, down to an altitude of about 30 km (20 miles). Particle sizes probably lie in the range of 0.1 micrometre (0.000004 inch). There is evidence that they undergo seasonal changes in density, becoming thicker in Titan's summer hemisphere, which suggests that they are a form of natural "smog" formed by the action of solar radiation. Solar heating of the particle layers creates a temperature inversion layer in Titan's stratosphere, preventing the smog layer from dissipating by convection. The haze particles are thought to settle slowly through the atmosphere and accumulate on Titan's surface. The amount produced throughout the history of Titan is calculated to be the equivalent of a continuous layer of organic solids covering the entire surface to a depth of at least hundreds of metres. Titan's atmospheric chemistry and the presence of complex organic compounds suggests that the moon may be a laboratory for studying the types of organic molecules and the chemical processes that led to the origin of life on Earth four billion years ago. Titan's nitrogen-rich atmosphere is thought to be not primordial but rather a secondary atmosphere like Earth's. It probably arose from photochemical dissociation of ammonia—an abundant ice in the outer solar system—into molecular nitrogen and hydrogen. The ability of a large moon such as Titan to subsequently retain a substantial atmosphere for billions of years depends on a delicate balance between surface gravity, atmospheric molecular mass, and solar heating. The higher the force of attraction between the moon and an atmospheric molecule, the longer the molecule is retained. On the other hand, the hotter the atmosphere, the more likely it is that the molecule will be lost to space. Jupiter's Galilean moons and Earth's Moon are too warm to have retained any abundant gases, but cold Titan and warm but sufficiently massive Earth both have retained the nitrogen molecule. Neither Titan nor Earth has retained the lighter hydrogen molecule. Little was known about Titan's surface before the Cassini-Huygens mission. Because the moon's haze is partially transparent to near-infrared light, earlier telescopic studies exploiting this property were able to show that the surface is not uniform. Images taken in near-infrared wavelengths by the Hubble Space Telescope in 1994 revealed a bright continent-sized region, later named Xanadu Regio, on Titan's leading face. This region was also discerned from Earth and from the Cassini spacecraft at radar wavelengths, which can penetrate the haze. As the Cassini spacecraft orbited Saturn, it made numerous observations during a series of close flybys of Titan beginning in late 2004. On Jan. 14, 2005, the Huygens entry probe became the first spacecraft to land on a planetary surface in the outer solar system, carrying out various physical and chemical measurements of Titan's atmosphere and transmitting high-resolution images as it descended by parachute. The Cassini-Huygens mission revealed that Titan's surface is quite young by planetary standards, with only a few large impact craters observed. 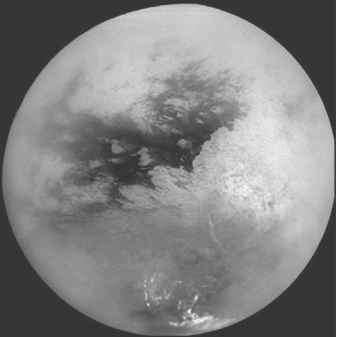 Titan's surface, like Earth's, is sculpted by wind and probably also rain (in the form of liquid methane). "River" channels coated with dark hydrocarbon deposits are common, sometimes running along faults and sometimes with extensive tributary systems. Features dubbed "cat scratches"—long, dark, east-west features hundreds of kilometres in length—may be dunes of dark particulate matter. Despite expectations of lakes and even oceans on Titan's surface, however, no surface liquids have been detected unequivocally.